This is one of the few miracles of Jesus that is recorded for us in all four Gospel accounts. At this time, Jesus is at the height of His popularity. We are told that a great multitude followed Him because they saw His miracles. This multitude was five thousand men not counting women and children. (Scholars estimate roughly 9,000-13,000 people present at this miracle.) After a day of teaching and healing, it was late in the evening and the people had nothing to eat. Philip is at a loss as to how to feed these people. Andrew [pictured on the right] found a child with a small lunch, five loaves and two small fish, but doubts its ability to feed such crowds. Still Jesus took the bread, gave thanks, and gave it to the disciples to give to the people. Thus thousands are fed. Upon seeing this multiplication, the people want to make Him king. However, when Jesus explained that He was the Bread of Life, the thousands who followed Him leave and Jesus is left only with His disciples. In this miracle Jesus teaches us two things: 1) That all daily bread, that is, all things we have on this earth – clothing and shoes, food and drink, house and home, etc. – comes from God. We are not to worry about these things for God will provide for us at His time in His way. 2) But most importantly, this miracle teaches us that our true daily bread is found in Christ given in the Word and the Supper. The connection to the Supper is easy to see. Jesus’ actions, taking bread, giving thanks, and giving it to people, mirror that of Maundy Thursday. In this Meal God provides us with far more than physical sustenance; He gives us the forgiveness of sins, life, and salvation. Therefore, here, at His altar Christ through His ordained ministers continues to distribute to us and to thousands His very Body and Blood so that we might eat and have eternal life. May we never be offended at Christ and depart from Him as the multitudes did, but remain firm and steadfast eagerly desiring to receive His Body and Blood for the forgiveness of our sins. 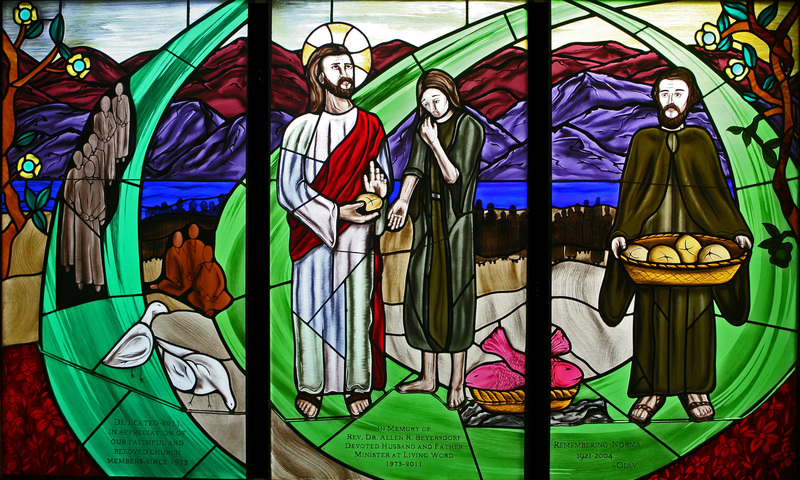 May this window continually remind us of how God miraculously provides this life-giving Bread for our souls.